While writing my book, I made the plot as plausible as possible, even though it delves into the paranormal. Readers will buy a few coincidences, but not a book full of them. What happened to me could never be included in a novel. It’s just too crazy. I hesitated to blog about it. My first annual cancer tests approached. Both my OB-Gyn and my oncologist were concerned about my thyroid and ordered a lab test. Life has its ups and downs. I prayed for a sign that everything would be okay. I have a few crosses and made an appointment to have them blessed. My favorite had been purchased with other silver jewelry at an auction long ago. The cross is very reflective and has an aquamarine set in the center. After it was blessed, I fastened it to my bracelet. Cool! I’d never worn a cross. Danny and I prepared for a weekend trip. Packing proved a breeze since we would only be away for two nights. I asked him what time we should leave in the morning. He thought 7:00 AM would be early enough. He handed me the itinerary and I never looked at the time of departure, but noticed the pre-TSA endorsement. This time he got it and I didn’t. I’m such a shady character. After waking at 5:30 AM and getting ready to leave for the airport, I looked at our departure time. He had misread it. We sped out the door. Danny threw my purse in the back of the car as I jumped into the driver’s seat. Our chances of making this flight were slim to none. I knew I had forgotten something and mentioned it on the forty-five minute drive to the airport. I was relieved to feel my phone in my back pocket. “I’ve got it!” he shouted back. Thank God. He joined the pre-TSA line and would run to gate C-49 to tell them I was close behind. When I finally made it to security, I checked my back pocket and pulled out a pen. My phone was gone! I either dropped it on the way, or it slipped out in the car. I bolted. With my heavy bag slung over my shoulder and silver flip flops that cut the tops of my feet, I sprinted back to the car. I was afraid to look. The front seats were empty. I’d left it at home or lost it while running to my flight. I didn’t have time to dink around, and yet, here I was. I raced through security and then down to the train. Of course, I had to go to Terminal C, the farthest away. I blew past everyone and ran up the escalator. I sprinted by everyone on the moving sidewalk. I looked at all the numbers and couldn’t find my gate. 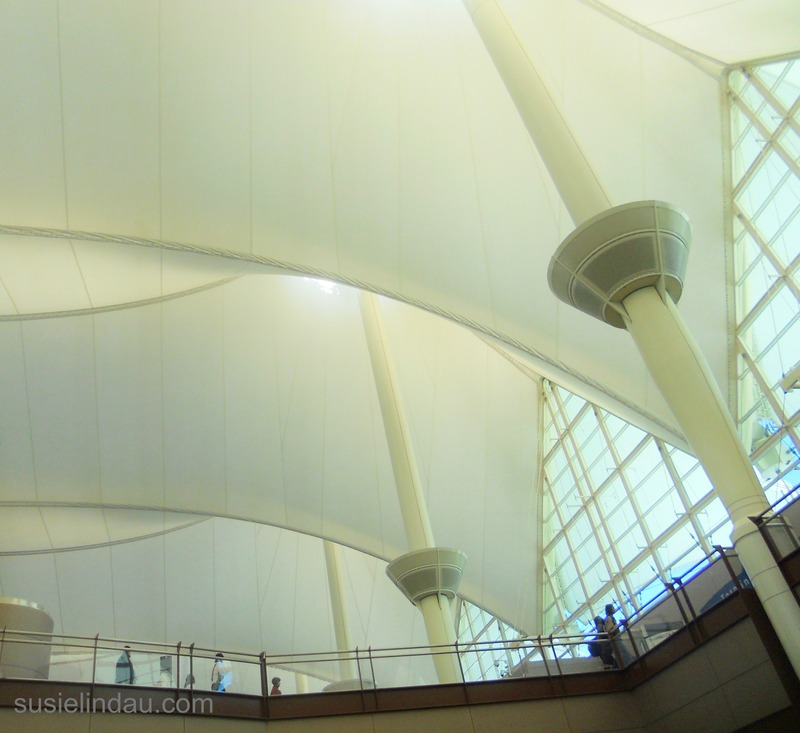 Soaked with sweat and exhausted, I continued my sprint through the main concourse to the other side of the terminal. Of course it was at the far end. Danny was standing in front of the gate. I made it! I sat down in the last available seat and kept coughing. That little fuzz tickled. The man next to me was a retired surgeon. He was very concerned and thought I was hyperventilating or having an asthma attack. “I started running a few weeks ago. I’m in great shape. I inhaled something.” The flight attendant brought me a cup of water. “Someone else needed a sign and found it,” he said. I smiled and thought I could also use a sign. When I told my story over the weekend, others agreed sometimes we lose things so others can benefit. I called my son, Kelly, who house-sat for the weekend. He ran upstairs to my office where I had charged my cell the night before. When we returned on Sunday, I stopped in lost and found. The man checked his computer, but couldn’t find anything fitting my description. He handed me a card with a website where I could fill out a form and a phone number to call. The next day, I ran several errands. I attended a class in Denver that evening. Tuesday, I played tennis and set my racket on the passenger seat. Afterward, I checked the fuel indicator. I was driving on fumes. I remembered the card as I pulled into the gas station. I still needed to email and call the airport about my cross! As I stopped in front of the pump, my racket slipped off the seat to the floor. I gasped. 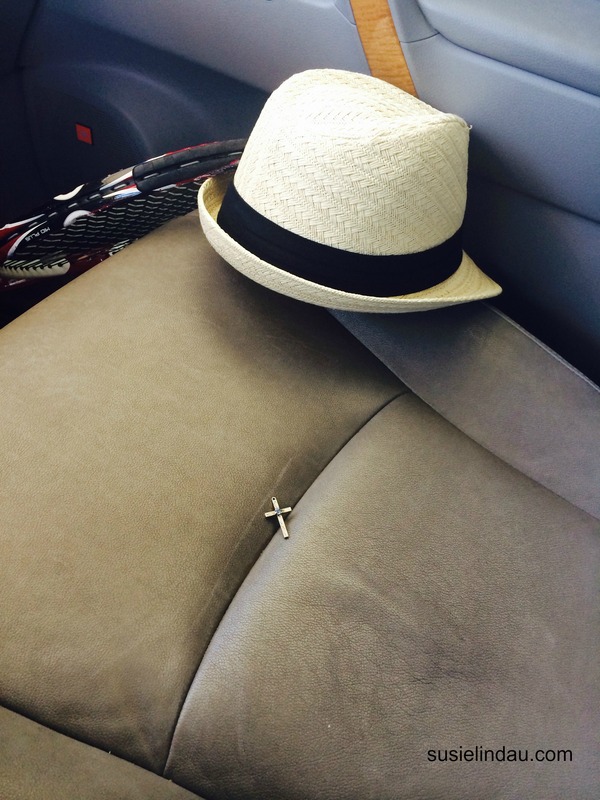 My cross sat right in the center of the passenger seat. While typing these words, I got goosebumps, again. Try setting something like a book or a purse on top of a surface without looking at it first. Really. Try it. It’s unnatural, right? How did I not see it the ten times I had set my purse on the passenger seat during the last few days? Danny must have sat right on it. How did the cross get there anyway? It was across the crack, not in it. If I’d found it on the floor, I wouldn’t have been so stunned. I had never sat or reached across the passenger seat before losing it. Remember, my purse was in the back of the car. The irony? I was thinking it may be sitting in lost and found at the airport when the racket fell to the floor. Everyone has their own belief system. To me, this was a sign. Could I work this into the plot of a novel? No. It’s too ridiculous. Even though I was in shock and began to cry, I had my wits about me and took a few pictures. My cancer test results came back on Monday. Everything was normal, including my thyroid. YAY! Truth is stranger than fiction and it’s usually more entertaining. Speaking of which, I’m truly happy to hear you’re doing so well! You got someone riding shotgun with you – that’s for sure. Cheers and congrats – for all of it. Putting out positive vibes always wins. That’s just how I roll anyway. We are flying out again soon, but this time we’re leaving 3 hours early!!!! That’s wonderful news, Susie. I’m so pleased for you. It’s a funny thing, that invisibility cloak. You can look at the same thing over and over and not see what is right there and then suddenly it’s there. Not as uncommon as you think, but very special. That has happened to me before. I couldn’t find my camelback. I looked in the closet where it should have been first then tore the house apart. I looked every where several times. Months later, I walked into the closet and there it was. WHAT???? I feel you here sister. I fly a lot and my plane is always at the opposite ened of the damn terminal. I’m also panicked that I forgot my phone or lost my wallet. They are usually tucked into a zipper compartment somewhere in my carry on bag and I forget where. I have done the jog of sweat to a plane too! Now you got me caughing up fuzzballs too. Good thing I’m not leaving today! I started running again and woke with a calf spasm. I had t stretch to get it from seizing up. It’s pretty sore today. I was shocked that I didn’t get any cramps during the Tough Mudder two weeks ago. By the 8th mile so many people had to hold up with calf and hamstring problems. Most of them were younger than us! We have very exhausted guardian angels Lena! Your story gave me goosebumps! Your lost crosses gave hope to others. So true how truth is stranger than fiction. My heart rate increased while reading this post. Let me catch my breath! I’m glad you made your flight and got to meet David and his wife, so glad you found your cross, and than God your tests came back negative! Take care, Susie. I just got criticized for a coincidence of a much smaller scale in a WIP. The world is small and crazy things happen every day!